A standard sunday morning breakfast in our home; palappam with chicken stew. Ahh...what utter bliss... soft palappams with their crisp brown lacy edges and the soft, white, melt in the mouth centres. My husband likes to soak his palappam centres in gravy while my little ones gobble up the appams without a fuss. as a mother, it is so satisfying to see my toddlers eating happily. Rohaan is three while Tania will turn two in May. Impressing guest is easy when this is on the menu, whether for breakfast or even a dinner party. 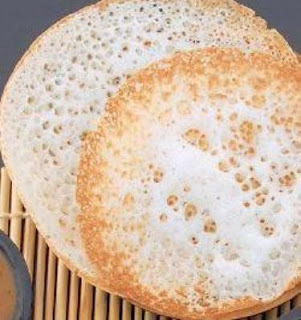 Appam and stew is a guaranteed find on most Christian wedding menus. It is a very delicious and healthy breakfast dish to start the day off. This recipe makes it easy to cook a difficult dish. Learn the authentic way of making appam by grinding rice and coconut and enjoy compliments galore from those who surround you. Wash and soak rice in enough water for a minimum of 4 hours. Cover and keep aside for fermentation for 7-8 hours. Mix the batter with a ladle. If the batter is too thick, loosen the batter with coconut milk, coconut water or plain water to get required easy pouring consistency. This is thinner than vellayappam batter. Enjoy them hot and crisp with your stew. Add a ¼ tsp of baking soda to the batter after fermentation to make appams even softer. Stirring the fermented batter too often breaks the bubbles in the batter and makes the appams hard. Personally, I prefer thin appams, lacy crisp outer edges and flat white in the centre; to make these reduce the amount of batter used for each appam. Left-over batter can be refrigerated up to two days. I find that cold batter makes good crisp appams. Reduce the amount of sugar as desired. More the sugar in the batter, faster the appam browns. The sugar caramelizes. Palappam batter is of pancake consistency while vellayappam batter is thicker and vattayappam batter is thickest.